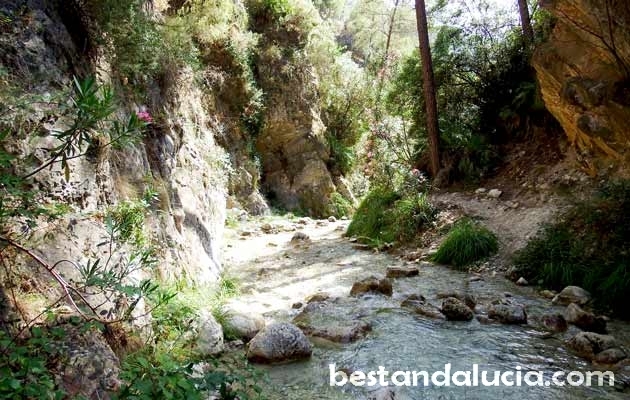 Rio Chillar, the chill-out river, is located just five minutes’ drive from the Nerja centre, at the Sierras de Tejeda mountains. It’s a very popular spot for Spanish families. Both kids and grown-ups can enjoy fantastic walk full of splashing in the crystal clear water. The route down the river starts very inconspicuously as initially the water barely covers your feet. On the sides of the river bed you will see some bushes, rocks and trees. Nothing spectacular. After 20 minutes of walking, the landscape gradually changes. 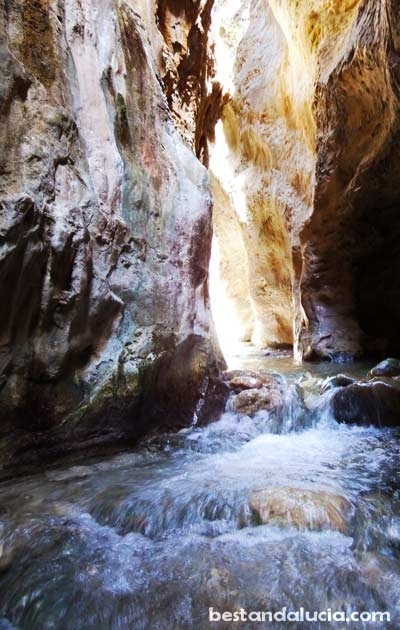 The river enters a narrow gorge and the water starts to get slightly deeper, but don’t worry, in most places it should never reach your knees. The high cliffs provide plenty of shade, making the walk really enjoyable for everyone. And that’s when the real fun starts! Jumping and splashing around, dipping in one of the several natural pools formed by the river, sitting underneath a waterfall – all these irresistible attractions can be found in Rio Chillar. Your kids will burn all their energy in no time. It takes around 3-4 hours to complete the whole route. However, you don’t need to reach the very end of the river to experience all the joys of Rio Chillar. Enjoy! A good pair of shoes is recommended as there will be lots of slippery pebbles and rocks under your feet most of the time. If you haven’t got anything suitable, visit a good sports shop with a wide range of light water shoes. During summer weekends Rio Chillar can get a bit busy, try to avoid that time. However, arriving in the morning can be a a good way of avoiding the crowds. Never visit Rio Chillar right after intense rainfall or when there is a forecast of rain as heavy rain causes water levels to rise very quickly.